TryC is for writing and running small C program for C learners. TryC is for writing and running small C program. It's just for C learners. Mac OS X includes Developer Tools, a developing environment for making Macintosh applications. However, if someone wants to study programming using C, Xcode is too big and too complicated for beginners, to write a small sample program. 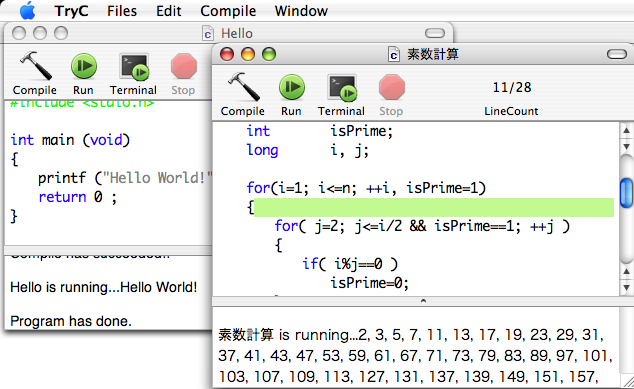 TryC is very suitable for beginners. You don't need to launch a huge Xcode application, or type unfamiliar commands in Terminal. 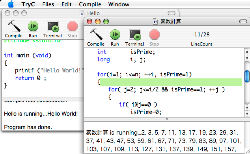 Using TryC, you can write, compile and run a C, C++ and Ruby program just like TextEdit. It's only available to compile one source code file but it's enough for trying sample programs. I hope you enjoy studying C, and that some day you will graduate to Cocoa. 7/14 v1.3.1 Fixed bugs that TryC couldn't run C source file two straight times. TryC is freeware. There is no limitation to use this software. Please note that the author takes no responsibility for any damage caused by the use of this software.